On Friday, September 23, 2016, stop by Encore Park for a free screening of Star Wars: The Force Awakens. 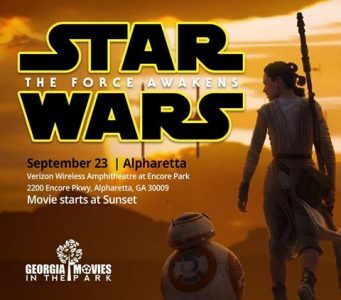 Celebrating its 10th year, Northside Hospital’s Movies in the Park™- Georgia’s most family friendly, free outdoor movie experience- is proud to present Star Wars: The Force Awakens on Friday September 23rd. Thirty years after the fall of the Empire, a new threat has risen from the ashes. A scavenger named Rey and rogue Stormtrooper Finn, with the help of the droid BB-8, must work together to locate legendary Jedi Luke Skywalker before it’s too late. Gates open at 6:30pm and the movie will begin at sundown (approximately 7:45). No outside food is permitted. Food will be available for purchase inside of the venue. Patrons may bring one factory sealed bottle of water per person. There’ll be free face painting before the movie (first come, first served). Encore Park is located at 2200 Encore Parkway, Alpharetta. For more information on what to bring, please visit http://www.vzwamp.com/faqs/ or call the venue at 404-733-5010.